This South Okanagan – Similkameen national park reserve public consultation process is Parks Canada’s opportunity to share the latest information on the proposed national park reserve boundaries, provide an overview on key aspects related to land management, consider the views shared by the public in past consultations and invite new questions. This is your opportunity, as members of the local community, region, and as Canadians, to provide further feedback and have your say. Between December 10, 2018 and March 15, 2019, Parks Canada invites Canadians to discuss the proposed national park reserve in the South Okanagan – Similkameen. This section provides an overview of key aspects related to land management within the proposed national park reserve and addresses views and questions that have been identified through past consultations. Read the topics that interest you most or read them all. Add your comments, participate in discussions or ask us a question. Working Boundary: This term is used to describe the boundary of the proposed national park reserve, where private lands, along with Crown lands are also present within the boundary area. The line on the map is what Parks Canada proposes to achieve at some point in the future, however, it will take some years to realize. Privately owned lands will remain under the title of the private owner(s); a national park reserve designation would not apply to private lands. The regional district will remain as the administrator of by-laws on privately owned lands. Private lands may be considered as part of national park reserve at some point in the future, but only on a willing-seller willing-buyer basis. No lands will be expropriated as part of a national park reserve establishment. See maps for private lands parcels around Spotted Lake and Fairview - Cawston Road. If your property is in the middle of the proposed national park reserve, it will still remain your property, under the by-laws and regulations of the regional district, and where applicable provincial statutes. In order for you, guests, family, friends or patrons to access your property, you will not need to pay fees, toll road fees or the like. Parks Canada has no jurisdiction over how you manage your private land. 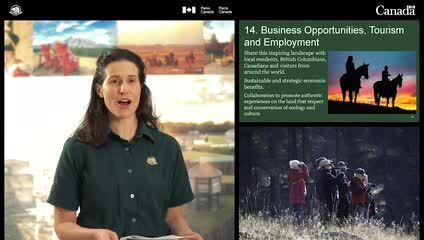 Bordering a national park reserve can have immense benefits and, as good neighbours, Parks Canada welcomes the opportunity to work with private land owners towards common objectives. Knowing access and private property rights will remain unchanged, what concerns are still on your mind? Long-term relationships with ranchers are critical to the future success of a national park reserve in the South Okanagan – Similkameen. Although commercial livestock grazing is not typically allowed in a national park reserve, Parks Canada is committed to working with ranching families to provide certainty and stability on their respective Crown grazing tenures. Ranching families within the proposed national park reserve will be able to continue operating as they are today with a similar regulatory framework. Parks Canada is in a position to assist grazing tenure holders with capacity funding to work together to address common stewardship objectives. A transition plan is currently under development. If you are a rancher and/or a holder of a grazing tenure in the proposed national park reserve boundary, the project manager will be in contact with you to discuss next steps and go over questions in greater detail. A small amount (14 percent) of the total lands within the proposed national park reserve boundary are considered as part of the Agricultural Land Reserve (ALR). Approximately 80 percent of these ALR lands are under private ownership. This means three (3) percent of the total hectares within the proposed national park reserve are designated as ALR provincial Crown land. These ALR lands will not be developed or lost from the landbase if transferred to Parks Canada. The shrub steppe ecosystem found in the interior of British Columbia, including the South Okanagan – Similkameen, is recognized as one of the country’s most endangered natural systems. These rare pockets of semi-arid desert are the only occurrence of this ecosystem in Canada; they form the northern tip of North America’s Great Basin desert. By establishing a national park reserve in the South Okanagan – Similkameen, Parks Canada will protect and represent this rare and endangered ecosystem in the national park ‎system, and protecting this area would support recovery of 30 federally-listed species at risk, and protect habitat for a substantial number of other species. What species and spaces within the proposed national park reserve boundary are most meaningful to you? Wildfire management and the use of prescribed fire and fuel reduction will require a collaborative approach. Syilx peoples have managed the landscape through controlled burns for millennia. The role of the British Columbia Wildfire Service is to mitigate impacts of wildfire on life and assets, Crown forests and grasslands, and prioritize fuel management and wildfire suppression in interface areas where communities and forests come together. Local and volunteer fire departments have lifetimes of experience protecting homes and community. Parks Canada is a leader, with more than 125 years of experience using fire management to prevent catastrophic wildfire, naturally restore and maintain the ecology of national parks and manage fire and fuel sources to protect important resources and infrastructure. Parks Canada eagerly awaits the opportunity to learn from and cooperatively work with the Syilx peoples, British Columbia Wildfire Service and local community fire departments and municipalities to develop fire and vegetation management plans for the proposed national park reserve to protect the places and spaces that we all love. What are your biggest questions about how Parks Canada manages fire?